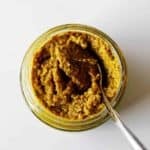 Easy to make, with normal ingredients - Homemade Yellow Curry Paste! Throw all ingredients into a food processor and be an instant curry master! It's ready in 15 minutes and is perfect for curry night! Use this in any recipe that calls for yellow curry paste. I use 1/3 cup for the 2 of us so 1 batch lasts 3 meals. *We like our curries extremely mild so I only use 1/2 tsp of the fresh crushed chillis that you can buy in a jar next to the crushed garlic and ginger at the supermarket. Use more chilli depending on how hot you like it and remember that this quantity of curry paste will be split into 3 (cooking for 2 people). 1 tsp of fresh crushed chillies is equivalent to about 1 whole chilli, so you could also use fresh chilli.